Home News Revealed – Pro Circuit Kawasaki’s West Coast line-up! Pro Circuit Kawasaki traditionally keep their riders guessing as to who will be racing West and East in order to have everyone ready to race in case of injury, and it’s only now they have revealed who will ride where. Adam Cianciarulo and Garrett Marchbanks will ride West leaving Austin Forkner and 250 veteran Martin Davalos on the East coast. 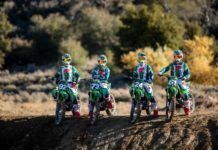 It mean Cianciarulo will be the man Mitch Payton has pinned his hopes on to get the West coast title a against the likes of Ferrandis, McErath and Hampshire as Marchbanks is still gaining experiance as he adapts to the pros. But it gives Payton two genuine title threats out East with Forkner who was neck and meck with Osborne until he got hurt last year and the always fast but often unlucky Davalos. Video: Austin Forkner Litpro Daytona!